The photos say it all. I just bought a (very) used Mitsubishi pickup for my business (after spending a month looking for the right combination of price, automatic transmission, fuel efficiency and mechanical soundness), and not compromising on fuel miilage looks like a smarter and smarter decision every day. I only wish there were more light pickups available, with even better gas milage… why hasn’t anyone made a hybrid light pickup yet?!? Are you pissed off? Email me your gas station pump price pics and I’ll post ’em. [email protected] … or better yet: post ’em on your own blog! P.S. 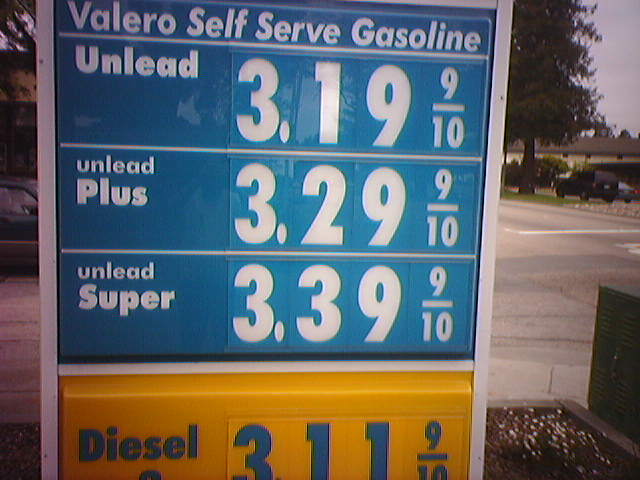 I saw regular selling for $3.43/gallon in South San Francisco just yesterday. Wanna take bets on when you’ll see it at $4.00/gallon? San Francisco has a 50 cent per gallon City Tax. 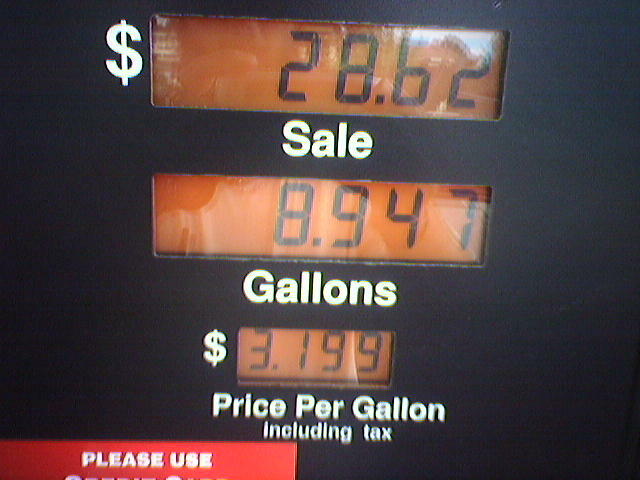 Without the tax, the $3.43/gal price is equivalent to $2.93, about the same as the average price of Regular everywhere in the US. San Francisco ALWAYS has the highest retail gas price in the country. The 50 cent tax is deliberately intended to discourage driving in the overcrowded city and to give people an incentive to take mass transit. If you don’t like paying $3.43, then don’t fill up in the City, or take mass transit. But…but…I thought you liberals were all in favor of higher gas prices to discourage consumption. Now that the prices are, indeed, high enough to discourage driving or force people to modify their behavior, i.e. buy a more fuel-efficient vehicle…now you’re “pissed off”? Seems like what you’re saying is that it’s perfectly acceptable to be in favor of higher prices as a conservation / efficiency incentive as long as it inconveniences somebody else but when these same liberal ideas – i.e. SF’s “jack-up-the-tax-to-discourage-consumption” local tax -affect YOU it’s all the fault of the President?